Viticulture: Organically farmed, entirely hand-crafted. 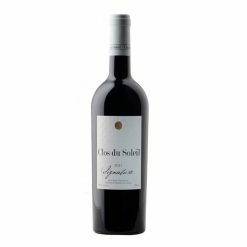 Signature is Clos du Soleil’s flagship Bordeaux-style blend of Merlot, Cabernet Sauvignon, Cabernet Franc, Petit Verdot and Malbec, produced by hand and aged for 17 months in French oak barrels. The 2013 vintage, the product of a year of ideal growing conditions, is a standout example of this iconic wine. The taster is immediately enveloped in the dense and layered perfumes of this wine, with notes of cedar, fresh blackberry and cassis, and a hint of cracked black pepper. On the palate the wine bursts with ripe fruit flavours – blackberry, raspberry and red currant – expressed through an elegant, mouth-filling structure and soft, round tannins. Enjoyable in its youth, the fine tannins and beautiful balance of this wine will ensure its ability to age for well over a decade. 92 points, rate by Anthony Gismondi. Signature is the Clos du Soleil Bordeaux blend but I say Similkameen-style. The 2013 maybe better than the very fine 2012. It is a 51/34/11/2/2 blend of merlot, cabernet sauvignon, cabernet franc, petit verdot and malbec from Cawston and Keremeos. A reduced percentage of cabernet sauvignon and reduced oak ageing (now seventeen months) are setting this wine free. The fruit is pure and raw at this point with rich blackberry/black raspberry scents and flavour but all with restraint and refinement. Savoury cedar threads are spun throughout the wine setting off the black fruits, tobacco and oak. Again balance is the key here. Cellar this five years or grilled a steak if you must open the bottle. 91 points, rate by David Lawrason. This 51% merlot, 34% cab sauvignon grown on the home property. It shows lovely currant/plum fruit, cedar, dusty and savoury elements on the nose. It’s full, rich yet dry with a lovely mid-palate, then a very stony finish, dusty finish. Excellent to outstanding length. Best 2018 to 2022. Tasted February 2016. 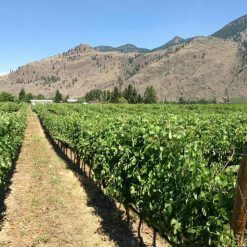 Our winemaking philosophy is to treat our grapes gently and with respect, in order to produce a complex, ageworthy wine that showcases the very best expression of the terroir of the Similkameen Valley. 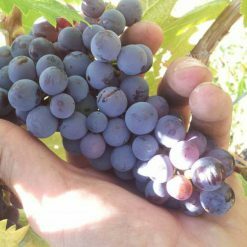 Each variety and each vineyard block was harvested separately, when judged to be at optimal maturity, gently destemmed and crushed, and then fermented, following a moderate cold-soak. More than half of the lots used only spontaneous, native fermentations, to reinforce terroir expression. After a gentle pressing, the wines were barrel aged for 17 months in 100% French oak barrels. Only those barrels showing the greatest complexity, depth, and ageability were selected for our Signature blend. In order to protect the nuances and beauty of this wine, it was neither filtered nor fined. Simplicity and a light hand in the winery have allowed us to deliver a wine which speaks of the beauty of our land. The name Clos du Soleil, a French term meaning an enclosed Vineyard of the Sun, refers to the rocks, soil, and sun, which together define this very special piece of land where we grow our grapes. The enclosure is the mountain that forms a tall natural stone wall at the back of our vineyard, almost surrounding the cobbled terroir which lends its unique flavours to our wines. 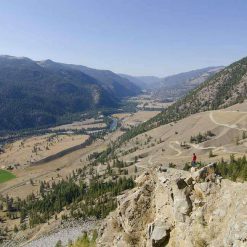 Most importantly, our name highlights the long days of sun which pour in on the Similkameen Bench, one of BC’s most unique and promising microclimates.